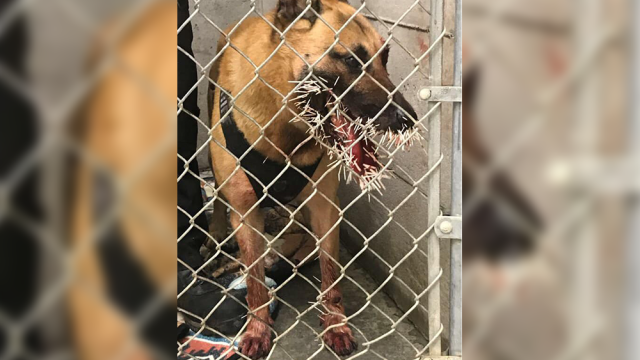 COOS COUNTY, OREGON — A Coos County Sheriff's Office K-9 is recovering after he came face to face with a porcupine during a chase and was struck in the face by more than 200 porcupine quills. Photos of "Odin" after the awful incident are going viral but don't worry, he's recovering at home and on the mend. The Sheriff's Office shared some graphic photos of Odin after the incident. We've attached a photo at the bottom of this article, keep in mind, the photo is a bit graphic. On Saturday, April 20, 2019, K-9 "Odin" was in the process of chasing down his 81st suspect in the Oregon county after the suspect ran from deputies. During the long track, Odin encountered a porcupine and he was struck with more than 200 quills in his face. Several of the quills went inside Odin's mouth and two hit near his left eye. Odin was rushed to Hansen-Meekins Animal Hospital where he was sedated and treated for more than two hours on Saturday night. The Coos County Sheriff's Office continues to look for the suspect involved in the chase and they continue to share updates on Odin's recovery. Click here to see more photos.